On September 4th, a construction crane crashed into an Orlando, Florida home. News reports claim that the roof was under construction when the accident occurred. The long arm of the crane crashes into the two-story home, splitting the last floor in half. The tip of the crane extended through the house Luckily, the house was vacant; therefore, no one was injured. This story provides a teachable moment as to how quickly things can turn critical on a construction site. That is it why insurance coverage and proper safety standards are imperative to avoid litigation and harm. Commercial General Liability or CGL insurance is the most common type of insurance in the construction industry. It provides coverage for personal injury, property damage caused during operation of a business, and any injury that occurs on the premises of the construction site. Because CGL is limited in its coverage, contractors will normally supplement their CGL coverage to provide insurance for other risks. Contractors are well served to supplement CGL with builder’s risk insurance. This insurance protects the contractor from specific construction site related damages. The policy will require the owner, subcontractor and the contractor to be named as insured. This policy provides coverage for the structure itself and all the materials involved. It also protects in the event of wind, fire, lighting, theft, acts of God, and vandalism. According to OSHA, in the fiscal year 2017, safety standards involving powered industrial machinery were part of the ten most cited standards. Lack of equipment safety has also been cited as one of the most injurious in the construction industry. OSHA standards are to be taken seriously. 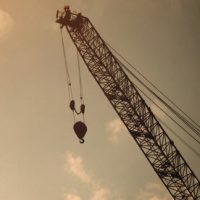 When OSHA publishes safety standards governing large equipment like cranes, they expect workers in the field to follow those safety standards as a means of preventing bodily and property damage. They also set safety training and requirements for individuals who operate large machinery including crane operators. There is no telling what occurred in the Orlando incident. Reports of the accident have not discovered or divulge the cause. Whatever the cause, adherence to OSHA safety and training regulations can help avoid preventable accidents on your construction site. Attorney Brendan A. Sweeney is an experienced construction law attorney with years of experience advising on construction insurance and OSHA issues. He specializes in advising and drafting agreements that will ensure your compliance with OSHA regulations and insurance requirements. Third parties, owners and contractors deserve the best protection against construction site hazards. Contact us now for a consultation.